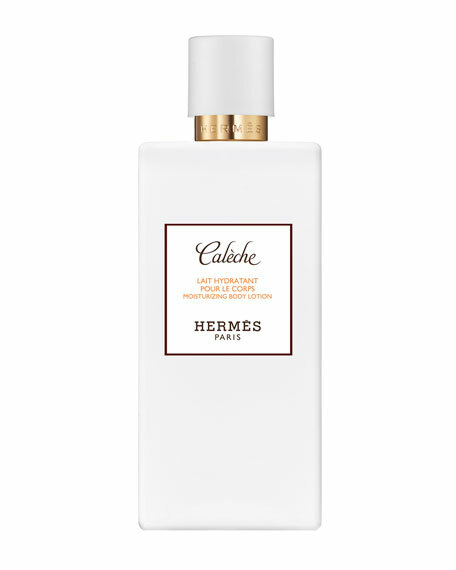 Hermès Calèche Perfumed Body Lotion, 6.5 oz. HermèsCalèche Perfumed Body Lotion, 6.5 oz. "Calèche or the essence of classicism. Seduction through the beauty of the soul." Jean-Claude Ellena. Composed by Guy Robert in 1961, Calèche is the first women's fragrance from Hermès. It is a very feminine woody, chypre floral, whose name refers to the horse-drawn carriages that are emblematic to the house. Calèche is a novel that dazzles thanks to the beauty of its raw materials, from the cheerfulness of citrus fruit to the modernity of aldehyde notes; from the floral heart embellished with ylang-ylang, rose and jasmine to the woody, chypre sillage underscored with the nobility of irises. The eau de toilette, a floral exuberance. The eau delicate, the sweetness and the youth. The soie de parfum, a woody generosity. The perfume, the extreme elegance and refinement of the floral bouquet, the nobility of woods. 200 mL / 6.5 fl. oz.